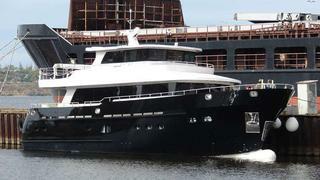 Fifth Ocean Yachts celebrated the technical launch of its Fifth Ocean 24 tri-deck motor yacht. Built in steel and aluminium, the 23.9m displacement yacht is designed for long-range cruising with a range of 4,100 nautical miles at a cruising speed of 8.5 knots powered by twin 205kW Caterpillar C7 engines. Design and naval architecture is by Ginton Naval Architects, while interior design is by Erik Van Dongen. Accommodations for eight guests are found on the lower deck in a full-beam master owner's cabin, VIP forward and two guest staterooms – all en suite – while two crew members are accommodated aft. A captain's cabin is set on the wheelhouse deck.